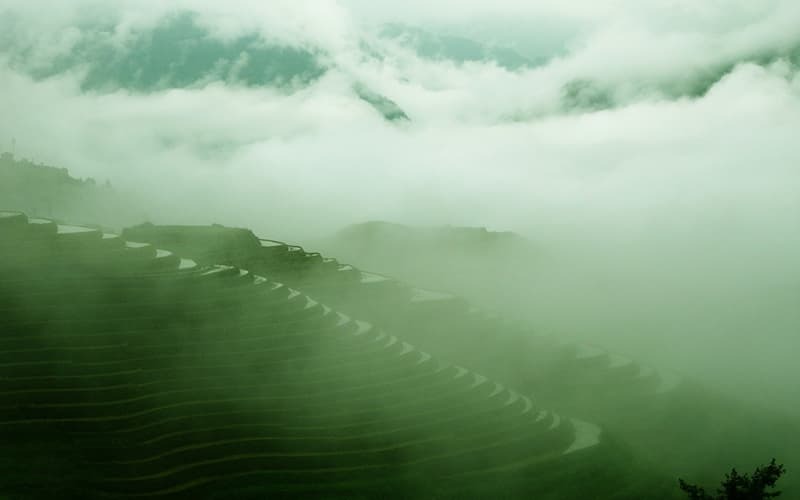 The Longji Rice Terraces provides a few of the most amazing sceneries you can find in China or perhaps the globe. Appealing when the sun's reflection glows in the paddy fields water, and when the yield is ripe, it shines. Dragon's back, also known as Longji is definitely an eye candy. There are around 25 square miles or 66 square km of adjoining fields. The rice terraces are constructed into the mountain sides & seem like great ribbons or amphitheaters as they spin around the bends in layered bands. The distinctly shaped karsts or hills, with the lush vegetation consisting of cornflies to bamboos alongside amazing caves and crystal clear waters, make the city quite a remarkable destination. It is a crucial cultural city with a 2000 years history. Ever since the Northern Song Dynasty, it has been offered as the economic, cultural and economic center of Guangxi. The Rice Terraces of Longji relates to numerous Longsheng County village areas. 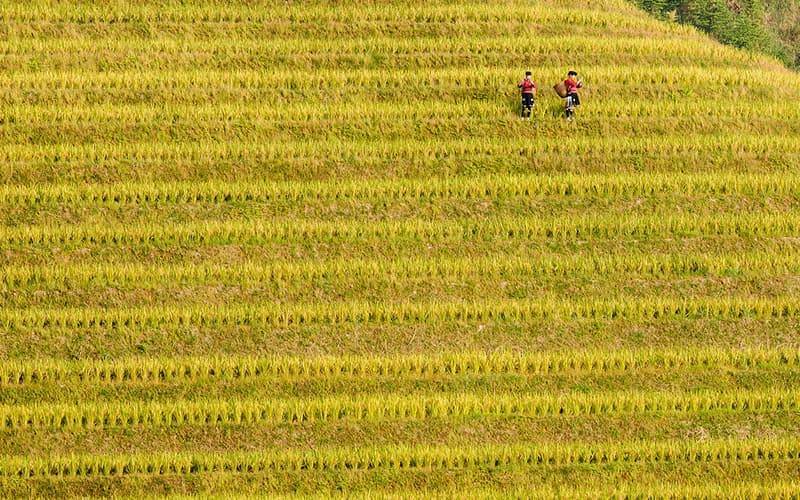 The most recognized terraced field areas can be located around the Village of Ping'an where a minority of the Zhuang people reside, as well as the Jinkeng area, which is the Red Yao's abode. The Terraced Fields of Ping'an Zhuang Village are the most developed and earliest terraced fields in Lobgsheng. It is also the best area for tourists. The fields are located around the village of Ping'an and two lesser communities. The Zhuang minority inhabit these locations. The villagers reside in the stilted three-story houses made of wood. The location is adequately equipped with the most recent facilities where accommodation, dining as well as transportation are quite convenient with more than 80 hotels and hostels available. 九龙五虎or Nine Dragons and Five Tigers or simply Nine Dragon denotes nine ridges which branch off from the major ridge. They seem like 9 dragons stooping over to take a drink from the Jingsha River. Also, there are 5 rocks that are tiger-like. 金坑红瑶梯田 or Jinkeng Red Yao Terraced Fields are not as close to the Terraced Fields of Ping'an from the entrance for tourists. The Jinkeng Terraces accommodates numerous Yao Villages which consist of Xiaozhai, Tiantouzhai, Dazhai, and Xinzhai. The major accommodation and attractions are situated around and in Tiantouzhai which is the Field Head Village and Dazhai known as the Big Village. Xishan Shaoyue or West Hill Music is the terraces highest point with the widest view. It is well-known for sunsets and sunrises. It requires two hours to get there on foot. Over 90 percent of the photos of Longsheng Terrace that have been published came from there. The 'Large-Scale Thousand-Layer Terraces' is quite low and not difficult to climb because all the routes are great. The terraces are amazing, and you will be able to view the house of the Yao people. It is a great location to view the sunrise. Golden Buddha Peak: This is the ideal location to take pictures of the sunset. The cableway from beneath the terraces for rice to the top is excellent for those who have difficulty walking. It requires 20 minutes as opposed to 3 hours of walking. Hiking from Dazhai to Ping'an takes around 4 or more hours. There are a reasonable amount of little paths, which could easily result missing your way, so to aid you in finding the appropriate route, a tour guide is crucial. There are numerous turns and twists in the uncut stone paths. Some areas are quite sloppy, so do watch your step. 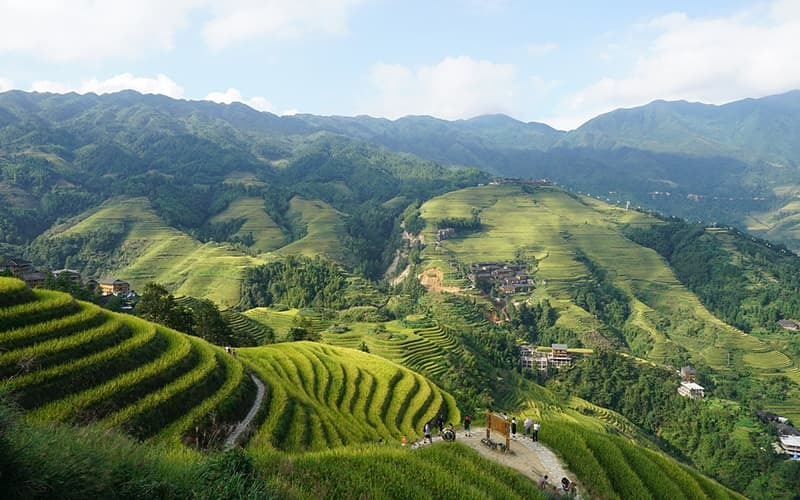 The main villages around the beautiful Longji Rice Terraces consist of Dazhai and Ping'an as well as Huangluo Yao Village and the old Zhuang Village of Longji, with specific cultural attractions. The Ancient Zhuang Village of Longji is situated at the southwestern part of the village of Ping'an. It is the least modernized and most traditional minority village of Zhuang in Longsheng. This area is the leading choice for people who have an interest in culture and history. The village takes pride at being the hugest stilted and ancient group of buildings in the Guangxi Province, a majority of which are above 100 years of age. It consists of a style of the Qing and Ming dynasties which are properly-preserved. With more than 400 years of history, the village accommodates 200 households of more than 1,000 people of Zhuang. Their outfits are brilliant and vigorous. The most distinct features are the stone bridges. There are more than 300 stone bridges among the 13 miles of terraces. Out of these, 75 are situated in the Ancient Zhuang Village of Longji. Swords, lotuses, and eight trigrams were developed on the bridges. Three Fish Share One Head is the most typical and was constructed on the Rain and Wind Bridge in front of the administrative office of the village. The village is quite large, and exploration may require half a day. Huangluo Red Yao Village situated 1km to the south of Ping'sn, is where more than 60 Yao homes consisting of more than 400 individuals live peacefully. It is recognized as the Top Long Hair Village in the World. It is custom for girls to put on lengthy hair in Huangluo & more than 60 girls have more than one-meter of lengthy black hair. The lengthiest is 2.1 meters. It was believed that the village has the Guinness World Record of individuals with the lengthiest hair. You can determine if a woman is married or not using her hair. A woman who is not married should ensure her hair is packed in a cloth. You are unable to view her hair. A woman who is married also packs her hair but will ensure a bun is left outside. The umbrella dancing & red-stick dancing and long-hair show take place in the village. If you desire something that is not too staged, it's best to skip this. You can benefit from various sceneries for several months. Autumn and spring are the most recognized periods to go hiking and take pictures. From the month September to the start of October, the rice is ripe on the fields. You will find golden yellow layers. From the 15th of October to April, you won't see anything more than a bare scenery of brownfields and perhaps snow. We know the destination very well. You can trust us as your private guide to Longji rice terrace! We will take you to the best photo sights looking down the winding terraces. Our experience will easily take you to avoid the crowd and enjoy the beatiful view at the most. Our tour also offer you a great chance to plant rice and visit local villages. We also design tours including Beijing, Shanghai and Xi'an. See the following tour packages for inspiration. You can revise those tour according to your requirements by contacting our travel consultants.